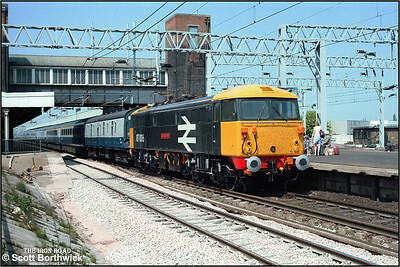 87006 'City of Glasgow' passes Nuneaton on 14/05/1984 with 1M05 0910 Glasgow Central-London Euston 'The Royal Scot'. At the time the service actually started back at Ayr, running as 1A12 0755 Ayr-Glasgow Central before heading south of the border. 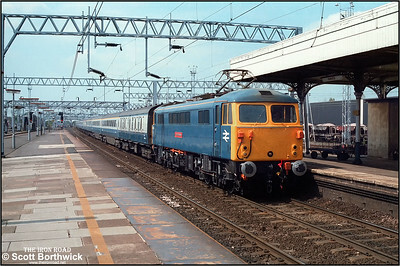 87024 'Lord of the Isles' slows for its stop at Nuneaton whilst working 1A49 1315 Manchester Piccadilly-London Euston on 14/05/1984. 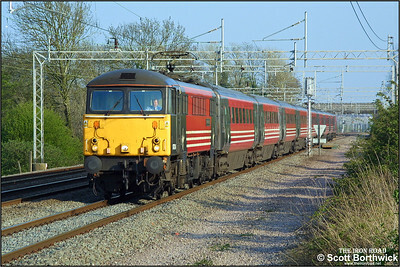 87024 'Lord of the Isles' races northwards at Cathiron with 1S86 1630 London Euston-Glasgow Central on 19/04/2002. 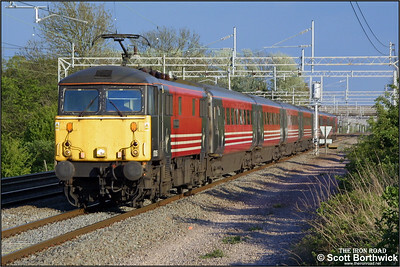 87005 'City of London' speeds north at Cathiron with a service from London Euston on 02/05/2002. 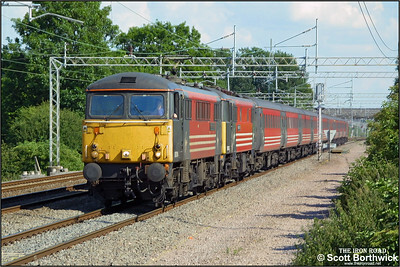 87014 'Knight of the Thistle'+86247'Abraham Darby' head north at Cathiron with a Virgin West Coast service from London Euston on 13/07/2002. 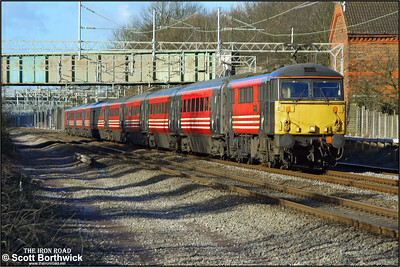 87032 'Kenilworth' heads for London Euston at Cathiron on 04/02/2003. On the date this photograph was taken, Scotland was experiencing severe adverse snowy weather and locomotives were required to haul, rather than propel trains. This resulted in a number of sets either having the locomotive hauling the DVT or the set facing the wrong way if it had been turned, resulting in the locomotive being on the London end of the train, rather than the usual country end. 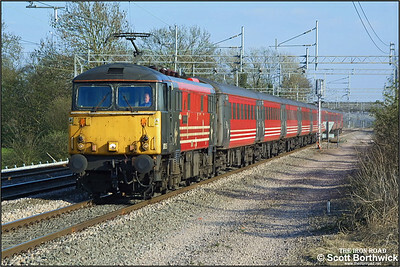 87008 'City of Liverpool' speeds northwards at Cathiron whilst working 1S84 1530 FO London Euston-Glasgow Central on 04/04/2003. 87019 'Sir Winston Churchill' looks immaculate after a partial repaint passing Cathiron whilst working 1C20 1530 FSX London Euston-Carlisle on 08/04/2003. 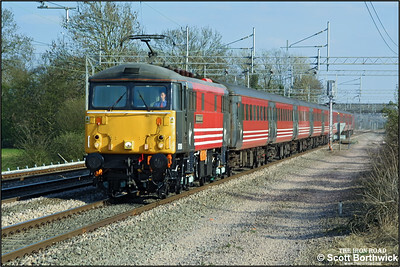 87035 'Robert Burns' passes Cathiron whilst working 1F20 1600 London Euston-Liverpool Lime Street on 08/04/2003. 87016 'Willesden Intercity Depot' powers 1S86 1630 London Euston-Glasgow Central at Cathiron on 08/04/2003. Freshly painted in Porterbrook house colours, 87002 certainly attracted a fair few onlookers during Crewe Works Open Weekend. 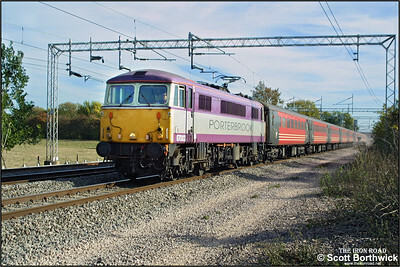 This photo taken on 31/05/2003 shows only half the story, the opposite side of the loco displayed a different livery, still however in the Porterbrook house colours. Images showing the other side can be viewed in several photographs in the Class 87 gallery. 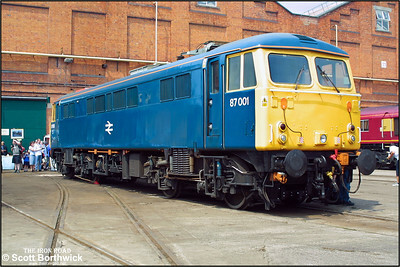 87001 is pictured at Crewe Works Open Weekend on 31/05/2003. 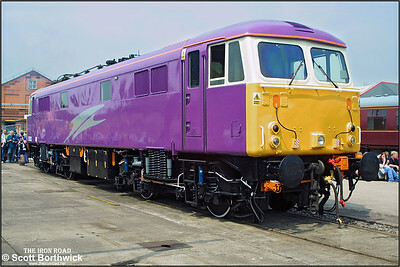 The following day the loco was renamed 'Stephenson'. 87013 'John O' Gaunt' brings up the rear of 1A65 1619 Wolverhampton-Northampton at Daw Mill on 30/08/2003. The train is being dragged by 57305. 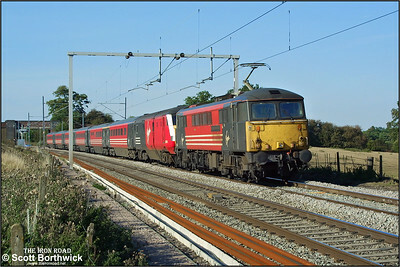 87012 'Coeur De Lion' speeds northwards at Dodford on 17/09/2003. 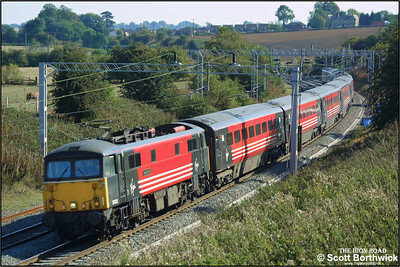 87014 'Knight of the Thistle' passes Brockhall on 17/09/2003 with a London Euston bound service. 87002 is in charge of 1P04 1325 London Euston-Preston at Cathiron on 15/10/2003. 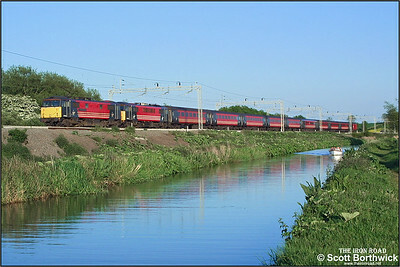 87001 'Stephenson' runs alongside the Oxford Canal at Ansty whilst in charge of 1S90 1730 London Euston-Glasgow Central on 18/05/2004. 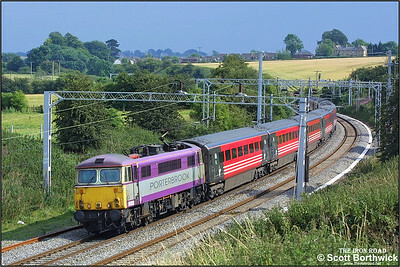 87023 'Polmadie' passes Ansty on 18/05/2004 whilst working 1F22 1800 London Euston-Liverpool Lime Street. 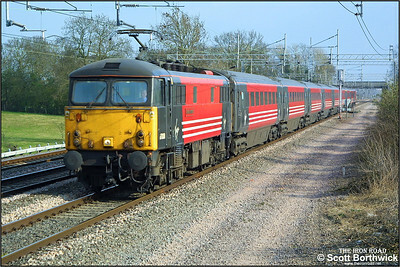 87026 'Sir Richard Arkwright' has 87035 'Robert Burns' dead inside whilst propelling 1A12 1735 Liverpool Lime Street-London Euston on 18/05/2004, pictured alongside the Oxford Canal at Ansty. 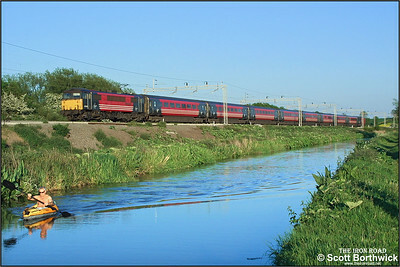 87008 'City of Liverpool' speeds northwards alongside the Oxford Canal at Ansty, overtaking a gentleman out for an evening paddle, whilst working 1S94 1830 London Euston-Glasgow Central on 18/05/2004. 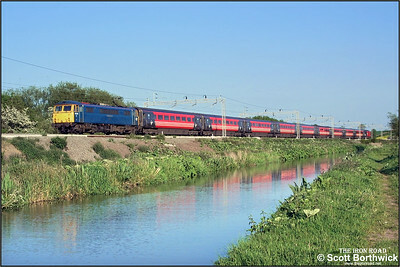 87002 is pictured running alongside the Oxford Canal passing Nettle Hill Farm, Ansty propelling 1M25 1146 Glasgow Central-London Euston on 07/06/2004. 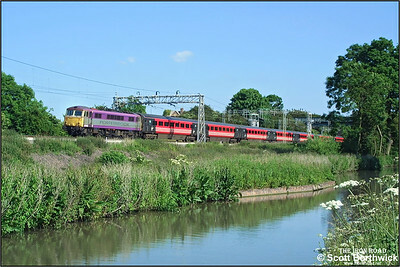 87002 runs alongside the Oxford Canal at Ansty with 1S90 1730 London Euston-Glasgow Central on 07/06/2004. 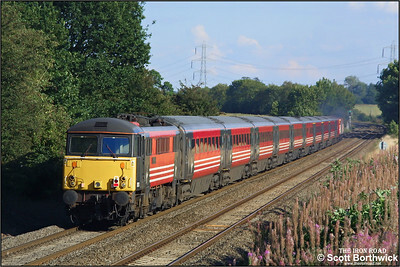 Under a threatening sky, 87002 propels 1A72 1519 Wolverhampton-London Euston past Dodford on 20/07/2004. 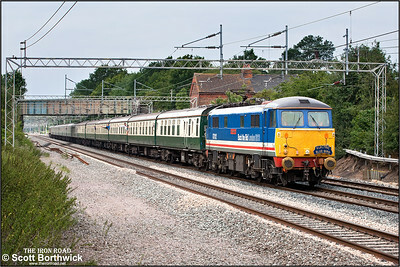 Sporting its 'Back the Bid, London 2012' livery, 87012 'The Olympian' provides the power for the Stafford-Mitre Bridge leg of Hertfordshire Railtours 'Bluebirds on Tour' railtour on 16/07/2005. 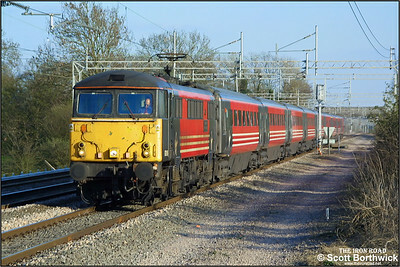 1Z93 0825 London Victoria-Mitre Bridge via Stafford is seen here passing Cathiron bang on time. 66715 which had provided the traction from London to Stafford is dead on the rear. 87006 'City of Glasgow' passes Nuneaton on 14/05/1984 with 1M05 0910 Glasgow Central-London Euston 'The Royal Scot'. At the time the service actually started back at Ayr, running as 1A12 0755 Ayr-Glasgow Central before heading south of the border.